Reegan Jackowiak attempts to tag out a Fort Myers base runner at third base during Tuesday night’s 6-3 district win over the Green Wave. Venice's Zac Calhoon rounds the bases after hitting a home run over the right field fence during Tuesday night's baseball game at Fort Myers High School. Mac Guscette lines a base hit during Tuesday night’s district win over the Green Wave. The Venice baseball team has come a long way since it first faced Fort Myers on March 8. The Indians won that game, 3-2, for their first district win of the season, but lost three of their next four games as they struggled to hit over .200 as a team. 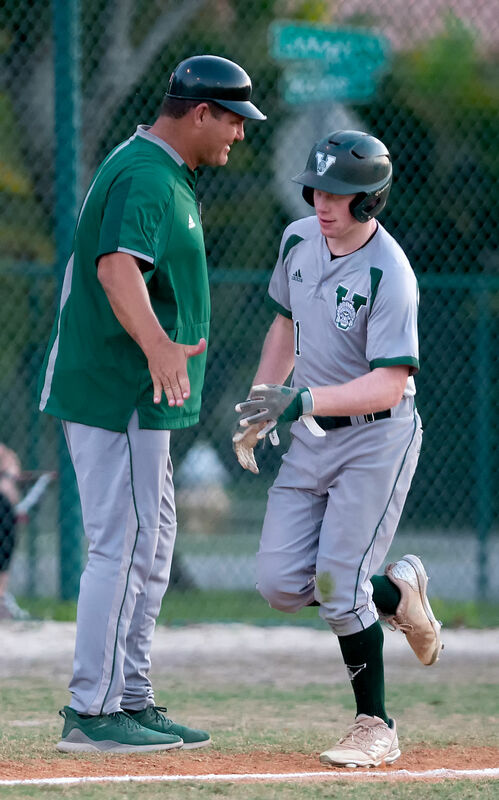 On Tuesday night, Venice (16-4, 5-0) showed that it’s past its early season struggles in a 6-3 comeback win over the Green Wave at Fort Myers High School to secure the No. 1 overall seed in the district. “We’ve won seven games in a row against really good competition,” Venice coach Craig Faulkner said. “That’s how many games it takes to win a state championship. You have to win through your district, then you win five in a row. So being able to do that really raises us up. Fort Myers (10-7, 2-3) and Venice traded runs in the first inning and Venice left fielder Zac Calhoon hit a first-pitch home run to lead off the second inning, but the Indians ran into trouble when starting pitcher Danny Rodriguez couldn’t find his command. Rodriguez had walked three batters before he could record an out in the second inning and Faulkner turned to relief pitcher Clay Callan to escape the jam. With two runners on and no outs, a bunt single by the first hitter Callan saw put Venice in a tight spot — leading 2-1 with the bases loaded. Though Callan allowed two runs to score on a single and a walk, he finished the inning with Venice trailing, 3-2, and in reach of a comeback. However, that comeback would take until the sixth inning. An inning after shortstop Kevin Dubrule tied the game at 3-3 with an RBI single to centerfield, the hits poured in for Venice. Chason Rockymore led the inning off with a scorching infield single that the shortstop couldn’t handle, and Rodriguez made up for his command struggles with an RBI double to the fence in right-centerfield. Then, a hit by Marek Houston set up Mac Guscette to lay down a well-placed safety squeeze to add an insurance run. One batter later, Mike Robertson sent a line drive to right-center as the Indians stretched their lead to 6-3. Leading comfortably, Callan struck out two batters in the sixth before giving way to junior relief pitcher Jacob Faulkner — who also struck out two batters in the seventh to close out the win. The win gives Venice an undefeated district record with one more to play — a game at Charlotte on Thursday — and gives the Indians homefield advantage throughout the district playoffs. “That is our biggest goal from Day 1: To try to be the No. 1 seed in the district,” Faulkner said. “It’s a big advantage with our fans. Venice comes out for playoffs, and it’s really special.